The Rebel Sweetheart. : Sneak Peek | xoxo Minnie Etude x Disney Collection. 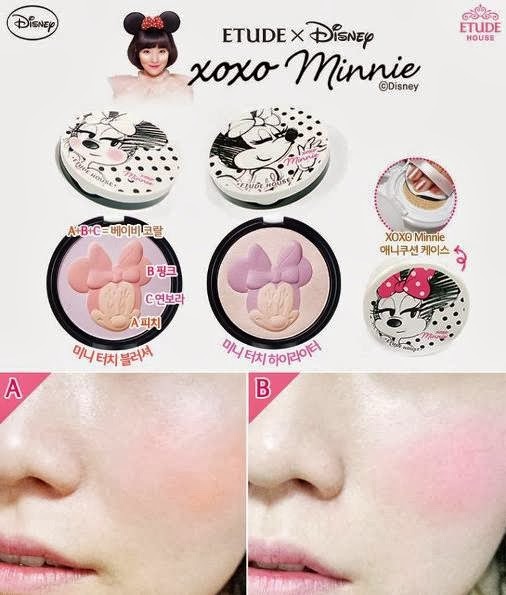 Sneak Peek | xoxo Minnie Etude x Disney Collection. Tomorrow, October 15, will be D-Day. 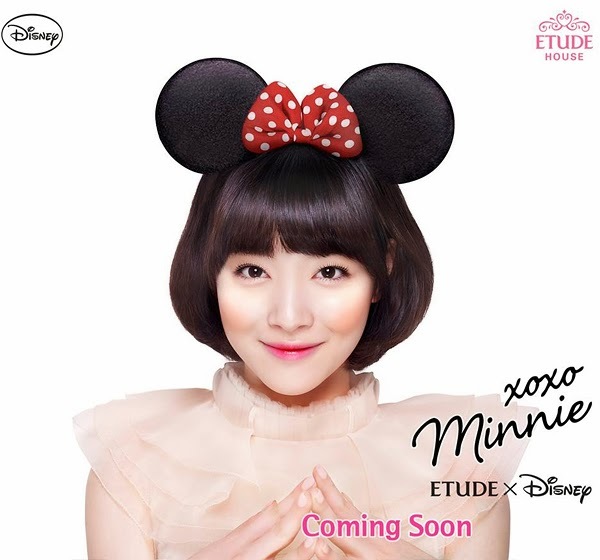 And I mean 'Disney Day', as Korean cosmetics giant Etude House launches the xoxo Minnie collection - a collaboration with the multinational mass media corporation, Walt Disney. Makeup enthusiasts, Korean cosmetics junkies (like me! ), and even Kpop fans have been buzzing about this upcoming collection, and here's a sneak peek at what Etude House has to offer. I see a lot of shimmer and sparkle in this photo, with those nail glitters and pink and red nail polishes. There's also a Volumizer Mascara, single eyeshadow pans, and false eyelashes to boot. 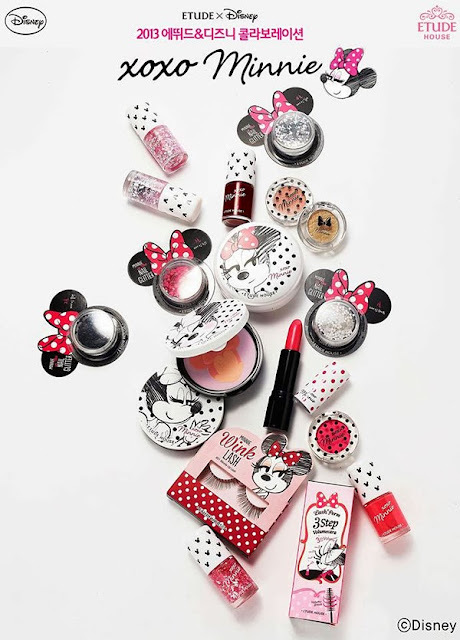 Of course you can't miss that pink lipstick - front and center, and that pan of blush with Minnie Mouse embossed in it. I'm officially lusting over the second blush. There are two blushes in this collection, with two different illustrations on the cover. The third pan, as it turns out, is a case for the Precious Mineral Any Cushion. The Cushion pact is actually refillable, so if you have refills in stock, you can simply insert it into this uber cute Minnie Mouse case. Now here's the thing. This collection will be released in South Korea only. I'm not sure if Etude House even has plans of releasing this collection in other parts of Asia in the near future, but for now, it's just gonna be South Korea. Having a husband who works in Seoul sure comes in handy, lol. How adorable is that collection! I love Minnie Mouse (and Micky too of course)-however I live in the US and nobody I know lives where they are selling it or are they going there! Oh well-I can just hope that it makes it to the US or on line which will ship to the US--That blush on the left would be a perfect color for me. Oh so pretty! I love minnie I can't wait to see this on our shelves! So cute! I love the Minnie casing. I'm mentally counting na how many to buy for Christmas. teehee! I really hope it'll be available in the Philippines soon. this is so adorable <3 cant wait to see this! what a collection!! I like the lashes!!! Adorable! We are huge Disney fans. This would make a great Christmas gift. I think you should offer a giveaway so that those of us not fortunate to have a hubby who works in Seoul can get our hands on one! I love it! What a great idea! I love Disney, and especially Minnie Mouse! This would be perfect for a present for my niece this holiday season! That is soooo cute!! I love all things Disney! I love the packaging and the colors look amazing! These are so cute! Somehow it just gave me a flash back of when I was a little girl and how much I loved collecting trinkets like these. Just seeing how cute the packaging is, I want to buy this na. I hope they release these kahit in Disneyland lang. oh my goodness these are so adorable!!!! omg! i wanted to have for my daughter haha i know she's too young but she would be delighter to receive makeup with minnie/mickey related items! love them! Lucky i have friends in S>Korea to get some for me! OMG a little girls dream come true! So cute! I love Minnie! Too cute! Oh wow! adorable collections! Korea is truly the source of cuteness! Collections like these makes me want to have a daughter to collect with. :P. Will check out Etude's branch here in our city. Thanks for sharing! The containers are as cute as can be in the photo, especially for the nail polish! That collection is adorable! Perfect for both adults and kids. I'd love to get my hands on some of those! I would love to see all of these in my stash. I love Minnie Mouse and I hope I'll get hold of this collection. Calling all the online sellers please make it possible for us to have it here. I love Minnie Mouse and I think this is so cute.. I know my daughter would love this..
How adorable is that collection! 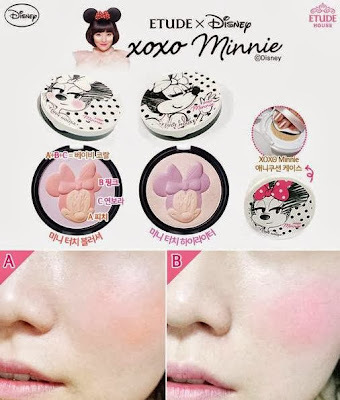 I love Minnie Mouse -That blush on the left would be a perfect color for me. I just love this collection. my daughter loves Minnie. Thanks for sharing! I hope these will become available here too!